Ava Clarke, Carissa Correa, Clementine Chappell, Emil Beinssen-Henry, Eva Mallison, Eve Charlesworth, Evie Holloway, Heidi Deakin, Isaac Driessen, Isaac Parnell, Jess Horstman, Jessica Lloyd, Jessie Jurd, Julian Correa, Kaelin Olliver, Katie Stefankowski, Layla Earl, Oliver Rofe, Skye-Michelle Baldwin & Thomas Bresnehan. Junior Company 2018 is the second time DRILL has run this program, the first being The Mountain Project in 2015. DRILL sees this is a vital part of our offerings in Hobart, providing opportunities for young people in this age group to engage with the company, leading on from our programs in primary schools. 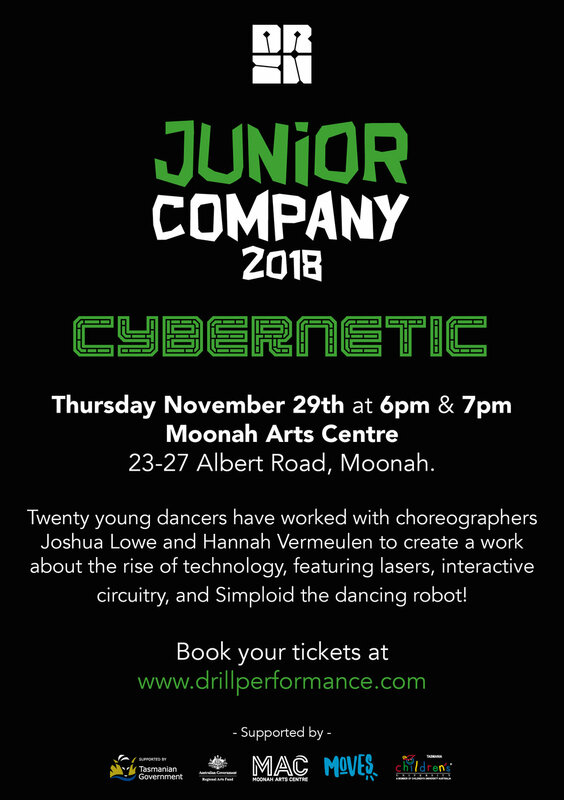 Junior Company members worked with choreographers Joshua Lowe and Hannah Vermeulen over eight weeks, hosted by the Moonah Arts Centre. Learning about and creating contemporary choreography, the dancers also used technology from the Peter Underwood Centre within the work, including a NAO Robot and Makey Makey circuitry. Cybernetic looked at the evolution of the human body and how this now continues with the advancement of technology. Combining movement and technology, the work explored how humans and machines control and communicate with each other.